The Future of DNN Speaks Razor - #2 But What is Razor? As you might have heard, you have to migrate to Razor sooner than later, and the earlier you start, the more you will be creating future-compatible material today. This is part 2 of the Series The Future of DNN Speaks Razor. In this post I'll explain what Razor is, why it's not MVC (even though Razor is popular there as well) and more. So What in the Gillette is Razor? Razor is a text-templating system based using .net placeholders and allows you to write .net code into the template. It's not limited to HTML and can also be used for any kind of text output. We often use Razor to template our e-mails, because it allows us to write very custom, complex output code outside our main line of code, just to create this e-mail. It also allows us to easily use different highly complex, smart e-mail templates for various purposes. Orange: a bit of code bridging some data to client side JS - like handing over a module-ID. This was all so much more complex with Webforms. So What is a Razor good for? And What is it not Good for? Technically, you could do everything in Razor, just like you could also create lemonade using a hammer and lots of lemons. But it's not the ideal use case. Razor is not ideal for generating binary data, for developing a data- or business layer. It's also not ideal for processing user input. And even though you could retrieve data in Razor (very easy, thanks to .net) you would typically not do it because of SoC (Separation of Concerns). Instead, data access should be in a separate code area containing all business and data logic. No. Razor is a view/templating-engine to combine data with a text-template and return a text-string. MVC uses it by default as the "V"-layer im MVC, but you could use MVC without Razor, and you can use Razor without MVC. The standard example is ASP.net WebPages - which are basically just some Razor-pages. 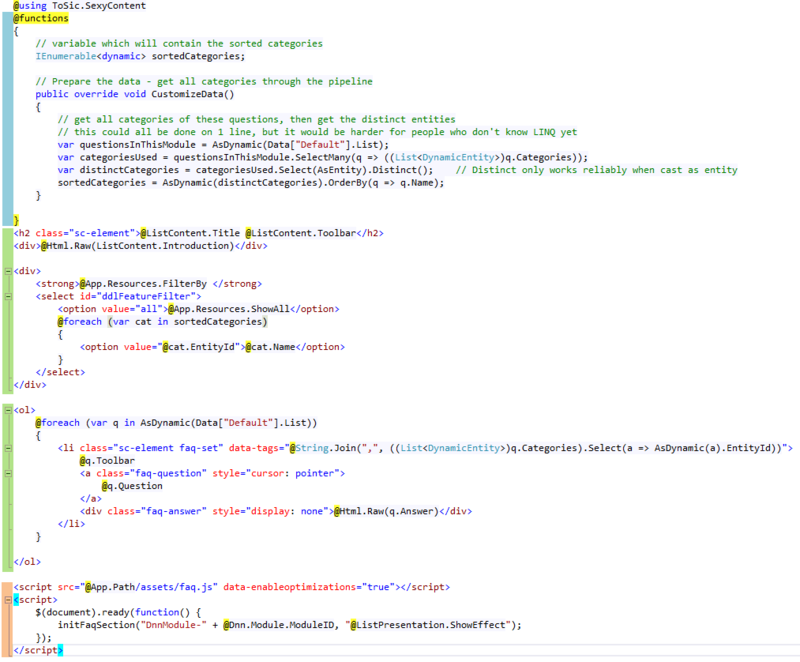 Yes, it works very well inside and within ASP.net Forms. But it's very different - when you start using Razor, you are usually reminded of the good-old classic ASP days, before the it became aspX, because it's just HTML with placeholders. What's "missing" is the event-attachment, code-behind, view-state, post-back and a few other things. These are features that software developers usually like, but web designers hate. Does Razor work with DNN? It works perfectly well with and within DNN! In a following post I'll write how to get started. For the impatient, try the DNN-Razor Host Module and watch this video or try packaged code apps by installing 2sxc and some of the Razor Apps like the Razor Basic Tutorials, List-Tutorials or the SQL and Peta-Poco Tutorials. Great Series Daniel. Very timely.